The #stopchanges2atw group have been extremely busy over the past year. A lot has happened and there is a lot of work which we are enormously proud of. We thought we’d share a few of the key moments of the campaign and also what’s happened with AtW to remind you how far we’ve come. Tom Watson, described by Limping Chicken as a “Labour Big Beast”, shows support for our campaign. We were very grateful for Tom’s support which got attention for our campaign and also, more importantly, raised awareness about the issue and what was happening within AtW. We we’re delighted that Jenny Sealey joined the campaign and became our spokesperson. Jenny is hugely respected, and has experienced cuts not only to her own support, but has seen other people’s budgets cut too. Having witnessed the impact these changes were having across the community, Jenny was therefore the perfect person to represent the campaign. We were extremely pleased to have the support of Teresa Pearce, a member of the Work & Pension Select Committee. Teresa has worked tirelessly on the issue of Access to Work and we can’t thank her enough for everything she has done. A milestone which we were very pleased to reach. We are continuing with the petition and are about to reach the 7,000 mark! We released a series of campaign videos to raise awareness for our campaign. There were nine videos, showing how different people were being affected. On 12th May the WPSC announced they would be launching an inquiry into AtW. We began supporting as many people as possible to make submissions and along with others, raised the issue of access to the committee clerk, enabling submissions in BSL. This was the first time that an inquiry had been made BSL accessible in this way which in itself was a significant moment. On 14th May the then Minister for Disabled People, Mike Penning, announced the suspension of the 30 hour rule and a review into AtW. This review was to last three months, however, it is still ongoing and we are not expecting to see anything until the new year. Alongside our work, DeafAtW have been guiding people through the Obudsman process. We see this as an alternative route to challenge what is happening with AtW. This is an important piece of work which we have been supporting wherever possible. We have been working with Leigh Day, the human rights law firm, over Access to Work for some time & have now had two successful outcomes. The first case we tried to take was settled, and the individual named had their AtW support fully reinstated. In the second case, we asked that the AtW guidance be published as we believed to not have this in the public domain was unlawful. This has now been acted on. We are very grateful to Leigh Day for all their work and support. In Particular we would like to thank Ugo Hayter and Richard Stein. We now have a fighting fund of £3,000 and are in a strong position to be able to make legal challenges where deemed necessary. We are continuing to communicate with Leigh Day and will look at any next steps needed in the new year. The inquiry receives a record number of submissions (over 300) and holds a series of four evidence sessions. The report is published before Christmas and is welcomed by the campaign, including all the issues we have raised. Teresa Pearce MP, Disabled People Against Cuts (DPAC), Inclusion London, DeafAtW, Graeae Theatre Company, NUBSLI. Access to Work (AtW) is a unique government programme which offers practical support to disabled people to help them stay in, or gain, employment. But it is helping only a minority of the people it could benefit, due to inadequate funding and a lack of awareness of the programme, says the Work and Pensions Select Committee in its report published today. The Committee concludes that AtW is an important element of specialist employment support for disabled people but finds that Department of Work and Pensions (DWP) staff are often failing to understand the needs of disabled people. The Committee also found that DWP’s recent rigid application of a “30 hour rule” for full-time “Support Workers”, and caps on the hourly rates of pay which it is willing to reimburse, has threatened the employability of deaf British Sign Language (BSL) users. The report highlights weaknesses in DWP’s administration of the programme: a newly established central call centre was poorly implemented and does not currently meet the needs of many disabled service users; and a reliance on outmoded paper-based processes often leads to a slow and cumbersome service. The Committee concludes that DWP needs to consult and communicate with AtW service users about changes to the service much more effectively in the future. DWP announced an internal departmental review of AtW in June 2014. The Committee’s Report is intended to inform that review, which the Committee hopes will lead to substantial improvements to the programme. “Access to Work should be a good news story for DWP. Where it works well, it transforms lives, allowing disabled people who might otherwise be excluded to participate in the world of work. But Access to Work’s modest budget risks an approach which seeks to boost the numbers helped by ATW by bearing down on the awards of people whose support needs happen to be high cost, including those who use BSL. Access to Work should be about removing barriers for the full range of disabled people who can benefit from the programme, including the relatively few whose support costs are high. DWP needs to make a strong case to HM Treasury for substantial additional funding for Access to Work and then take steps to increase take-up by improving the programme’s marketing. The Government should promote Access to Work much more proactively and widely, to both employers and disabled people, including previously under-served groups such as young people trying to enter the labour market for the first time. The 2011 Sayce Review of specialist employment support for disabled people included recommendations designed to lead to a doubling of the number of people helped by AtW. The number of people supported by the programme has increased in each of the last two full financial years, but remains below the peak of over 37,000 reached in 2009/10. AtW supported 35,450 people in 2013/14. The Department has acknowledged that a doubling of the number of people supported by the programme would require a broadly commensurate increase in funding, but so far the Government has only announced (in 2012) an additional £15 million for AtW, an increase in funding of around 15%. The Sayce Review recommended the phased closure or sale of Remploy’s factories, which had provided employment for some disabled people, with the savings released to be re-invested in “effective employment programmes” for disabled people, including AtW. But while the reorganisation of Remploy has been largely completed, the Committee notes that Access to Work has not yet seen a substantial increase in caseload or funding. DWP was not able to provide a clear indication as to how the savings from the closure of Remploy factories have been used to date, and the report calls for the Department to clarify this. The Committee received a substantial amount of evidence from deaf people who use AtW to fund the BSL interpretation they need to do their jobs. Deep concerns were expressed about the implementation of the so-called “30 hour rule” for “Support Workers”— DWP’s recent approach, in cases where 30 hours or more of support is required per week, of sometimes insisting that deaf people or their employers employ a single BSL interpreter on a salaried basis. In other cases it has capped the hourly rates at which it will reimburse BSL interpretation costs. Users reported that this has had a profoundly detrimental impact on their ability to source the effective BSL interpretation they need. “DWP’s recent approach to BSL is highly regrettable and betrays a lack of understanding of the BSL interpreting market and how BSL is utilised by deaf people at work. The costs of BSL are relatively high but it would be unacceptable for DWP to try to control costs by targeting a particular group in a way which threatens people’s ability to stay in their jobs. Introduce a Video Relay System to allow deaf BSL users to make contact more easily with the Department [para 129]. Finally an admission that ATW have “not met [our] customer service standards”. We would like to thank the Minister for this long overdue acknowledgement of the poor services that people have had to endure. Following this statement, we will be following the DWPs progress with keen interest on the immediate improvements outlined. We look forward to the governments response to the Work & Pension Select Committee report which becomes public available tomorrow. We will be publishing the report as soon as it is available along with Stop Changes response. 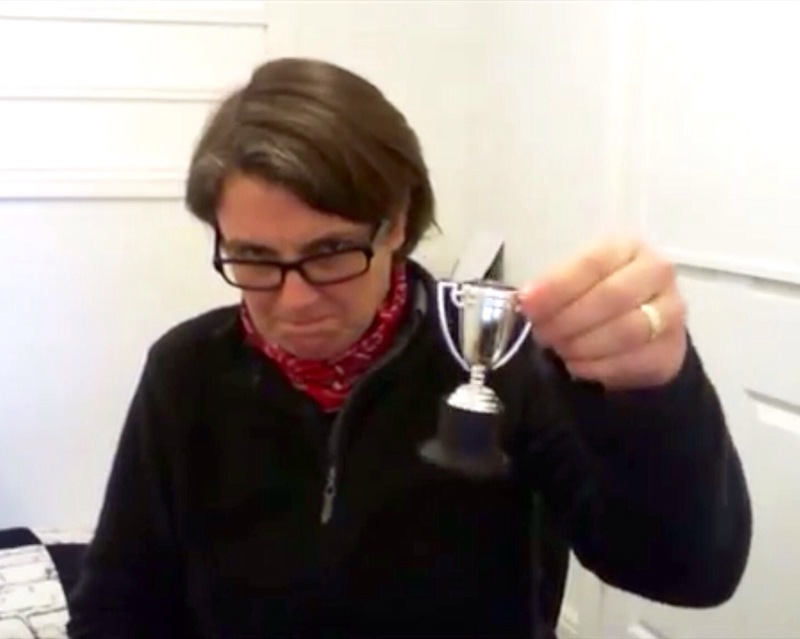 We were delighted to get awarded the best campaign of 2014 by Jen Dodds in her Limping Chicken article! Read/watch it here. Tomorrow we will be giving our response to the Work & Pension Select Committee report. Please look out for this. Work & Pension Select Committee Report: Release date announced. 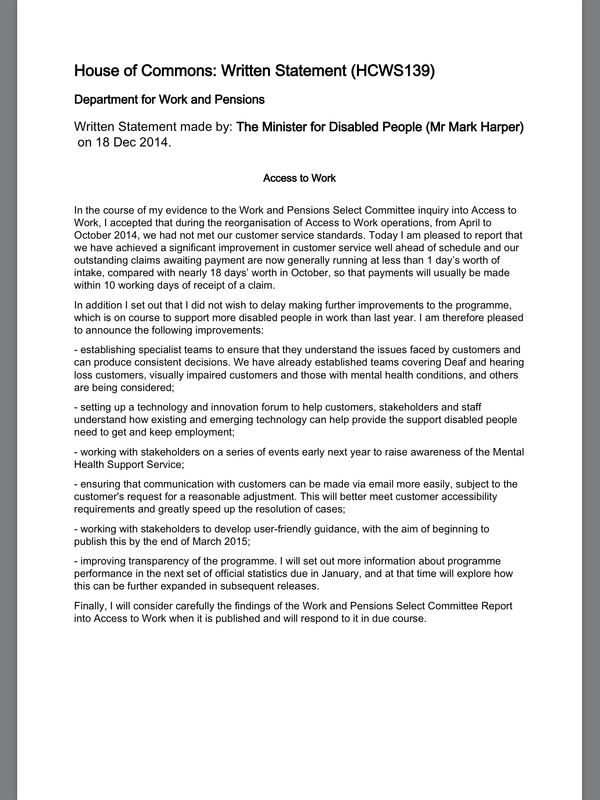 The Work and Pensions Select Committee will publish its report, Improving Access to Work for disabled people, at 00.01 am on Friday 19 December. It will be available under embargo to the media and witnesses only on the morning of Thursday 18 December. The Report’s Summary will be published in Easy Read and as a BSL video, and the substantive press notice made available as a BSL video, at 00.01hrs on Friday 19 December. Stop Changes will make a response available on Friday 19th December 2014. Support for DPAC after devastating blow by High Court. Stop Changes would like to offer a message of support to DPAC campaigners after a devastating blow was struck by the high court today. Read about the Independent Living fund closure and today’s ruling here. Why is this case important to Stop Changes? We have seen how an unlawful decision has not done anything to change the governments mind about closing the Independent Living Fund (ILF). We are attempting to take a case to judicial review as we believe the government have acted unlawfully in the way they have administered Access to Work. We need to look at what is happening with the ILF and be prepared for the challenges ahead. DPAC will undoubtedly be even more determined to fight on and have the full support of Stop Changes. What is happening with the ILF is important to everyone. It is about what we want our society to look like. It is about you. It is about me. We all need to get behind this campaign. Show your support for ATW! With just a couple of weeks before the Work and Pension Select Committee inquiry report is out, why not show your support for AtW by changing your Facebook and Twitter profile picture? We are also asking people to donate to Stop Changes fighting fund instead of sending Christmas cards this year. Please donate to: http://www.gofundme.com/stopchanges2atw and send a copy of our picture to your friends to show them you’ve donated! Today NUBSLI, with the full support of Unite the Union, have released their minimum fee structure. 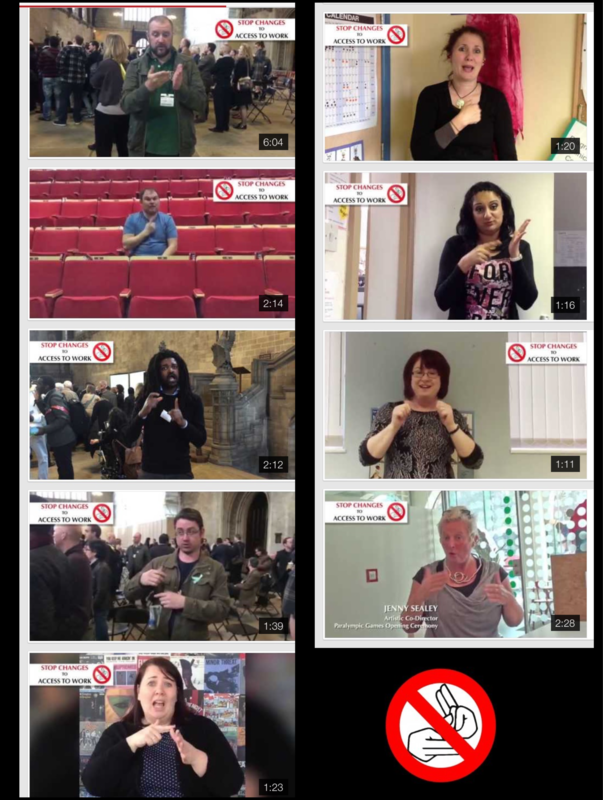 Attacks on BSL interpreters is an attack on the Deaf community. BSL interpreters are highly trained and skilled individuals who perform a vital role, providing access to BSL users. Stop Changes To Access To Work would like to send a message of support to NUBSLI and BSL interpreters who are fighting for the future of their careers.